The Rev Dr Daniel Premkumar is the Director of the Department of Dalit and Adivasi Concerns, which was set up by the Church of South India (CSI) in 2000. He is a visionary who is passionate about the cause of Dalits and tribal peoples. He lives with AIDS orphans. He is convinced of what he does. “For me it is a matter of faith to share my life with those who the world seems to have forgotten due to fear and stigma. It is an even greater challenge for me to be a father for children who come from different religions and traditions.” During this year the Department has sought to affirm Dalit and tribal culture and helped to ensure that a cassette of Dalit Christian folk songs was released earlier in the year. Dr Daleep Mukarji, the Methodist Connexional vice president, called on the Methodist people to “speak out, take sides,” and “stand up for justice.” Trained as a doctor in India, he saw the horrors of poverty among the Dalits so has a deep desire for the church to work for justice, inclusion and development that benefits the poor and marginalised here in the UK and across the world. At present one out of five people in the UK live in relative poverty (13.5 million people), including around 3.5 million children who are more likely to live in a low income household than the population as a whole. Jyoti Sahi was born in Pune in 1944, of a mother who was a Christian from Britain and a father who was a Punjabi Hindu. 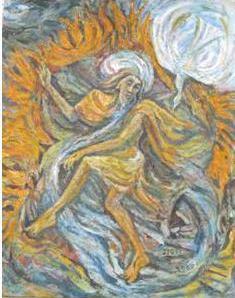 He was trained in art by Sudhir Khastigir, one of the early disciples of Rabindranath Tagore in Shantiniketan. 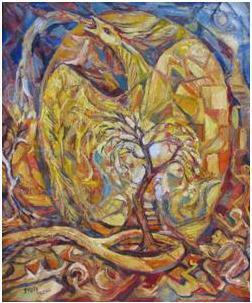 Jyoti further studied art in London at the Camberwell School of Art and Craft and upon his return to India taught art. He specialises in Indian Symbolism and Theology. 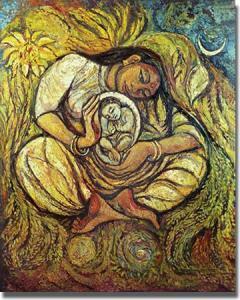 He is also known for Hindu-Christian dialogue through art, some of which are shown below.